I'm all about streamlining what's in my already huge diaper bag. Sometimes when I go out solo, I get such joy in just grabbing my wallet, phone, and keys and leaving the entire heavy bag at home. 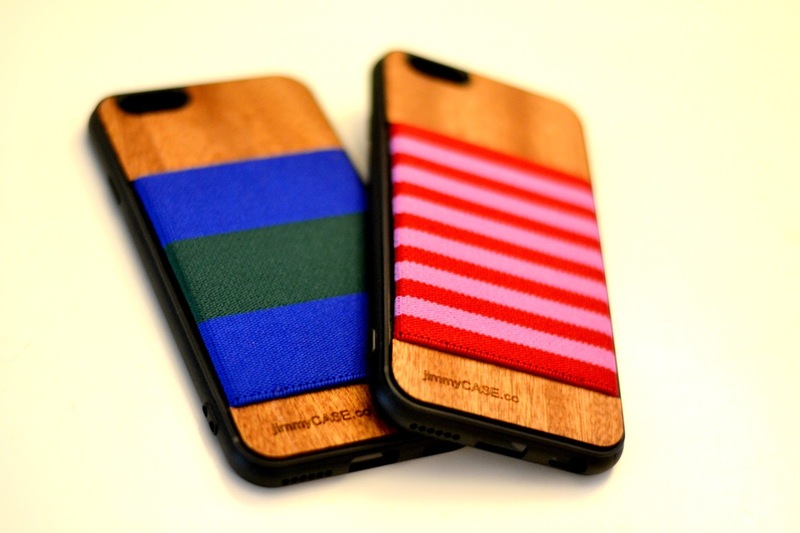 Recently, Ian and I were given the chance to try out a phone case from jimmyCASE. The cool thing about this concept is that it allows you to leave your bulky wallet at home for even more streamlining! The heavy-duty elastic at back holds credit cards and cash. You could even slip a housekey in it. 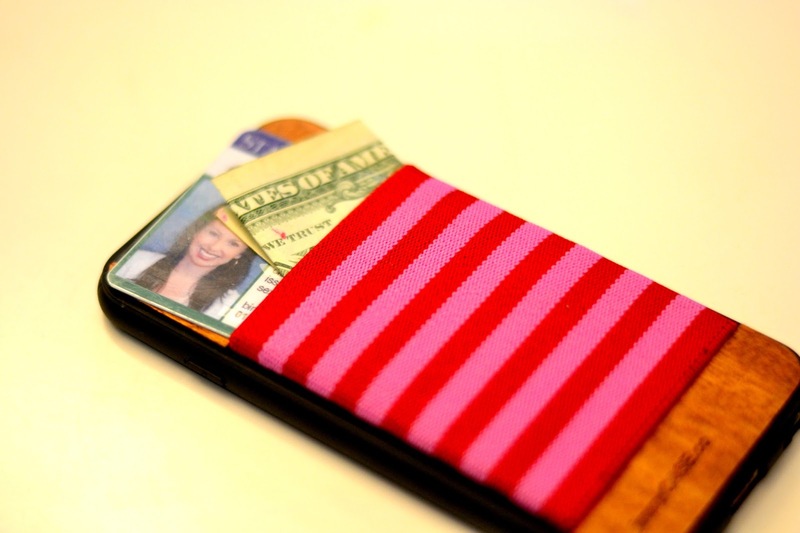 We both looked at the various color selections of the iPhone 6s wallet case, and we decided on this combo. Getting the new case on my phone was so easy, and it's not bulky at all. You can see this side image that I shot that shows how slim it is. The elastic back holds any combo of cash or cards that you'd like. So, would I recommend this phone case? Definitely. I love the natural mahogany wood on these cases and will be interested to see how they hold up over time. The elastic is so strong that I just don't see it losing any strength. 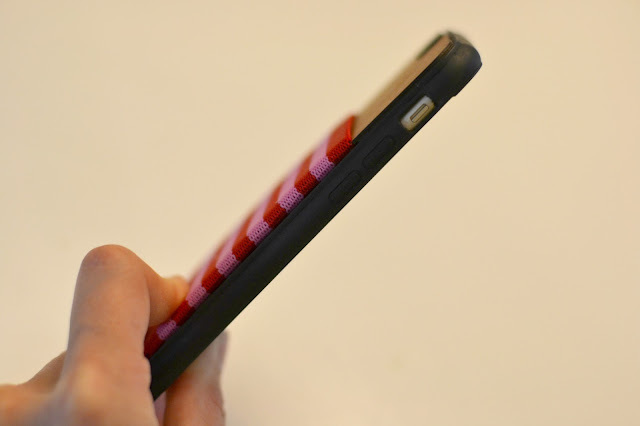 And they have great colors to fit a variety of phones! They are handmade in the USA and offer free shipping. Ian and I are both really excited to have stylish phone cases that streamline our lives and lighten our load. Bravo, jimmyCASE! Hey guys, I tasted the best cookie of my LIFE the other day and promptly asked the baker extraordinaire to share it with all of you! She's my sweet friend Caroline and she blogs at Happily Wed Happily Fed. I want you to think right now how amazing one of these cookies would be with your morning coffee ... YEP, I just went there. I turned a cookie into a breakfast food. Bam. 1. Connecting with blogger friends in real life. I've had the pleasure of doing that with April, and I can't say enough good things about her. 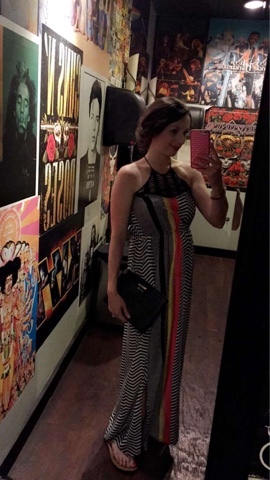 What you read on her blog (which I started doing when I got pregnant with Nora Beth and have continued daily since then), is exactly what you get in real life. Down-to-earth, adorable, and so so warm and kind. 2. Engaging my 18-month old in the kitchen. Our little chunk has never turned down a meal, but I have been eager to get her involved at mealtime, too! I let her help me with this recipe, and she's become obsessed with cooking... and "cooooookie tweets." 3. Maximizing my attractiveness for the benefit of those around me. You know what doesn't fall into that category? Traditional s'mores. Listen, I love the kitsch of them, but the actual logistics and inevitable mess that comes with assembling and enjoying and wiping away strands of marshmallow goo? Let's just agree that these cookies lend themselves to everyone's most nostalgic dessert while making them a little more company-friendly. 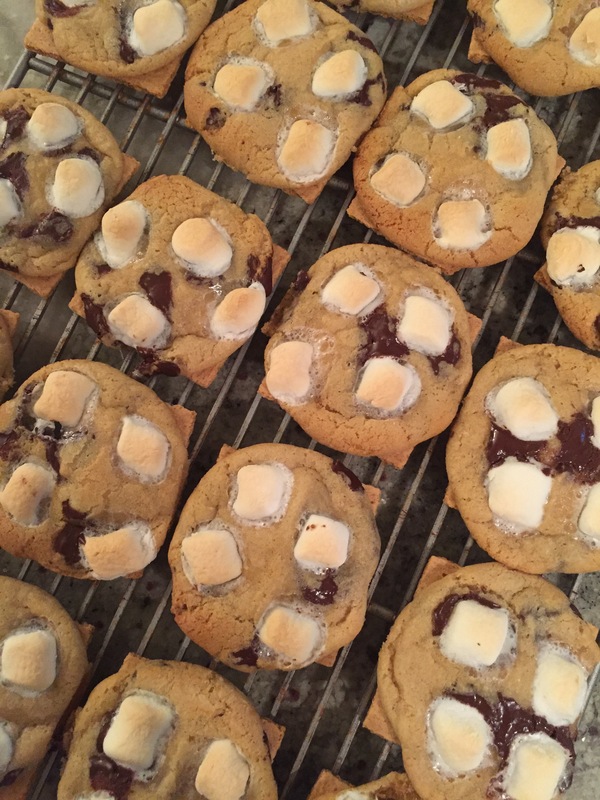 These s'more cookies are easy-peasy, but they deliver a package that will convince others around you that you spent way more time and creative brain cells on them. 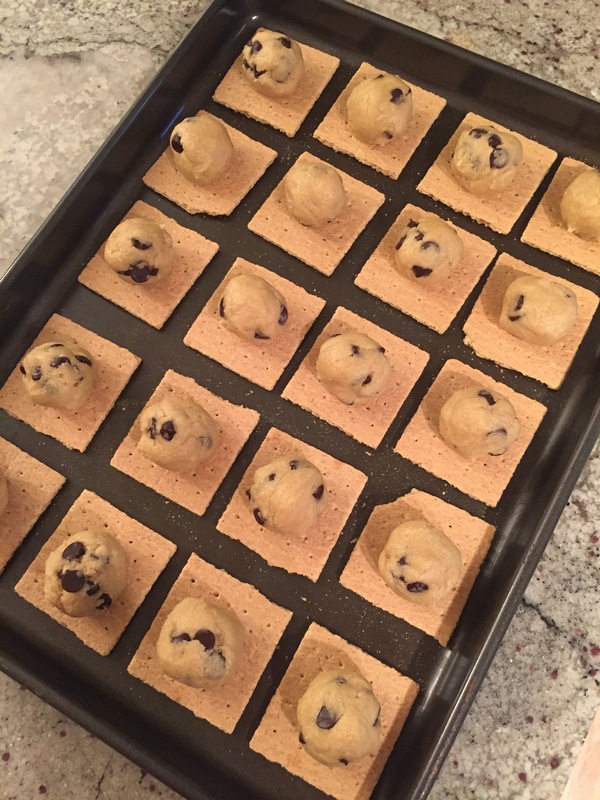 You can really use any cookie dough you want (I have my own favorite go-to straight chocolate chip cookie recipe), and in a pinch, you could even use a ready-made dough, BUT, having made these a number of different ways, I will encourage you to follow the recipe as listed below. The cookies provide the perfect amount of spread, density and taste to these beauties. Preheat oven to 375. On an ungreased cookie sheet, arrange graham cracker halves. In a large mixing bowl, cream Crisco and sugars. Add eggs and vanilla and stir until combined. Next, stir in baking soda, salt and flour. Mix until well-combined. Stir in chocolate chips. Form dough balls and place in the center of each graham cracker (the original suggests golf ball-sized. Mine aren't quite that big, but it's a good reference). Bake for 5 minutes. Remove from oven, and top each dough ball with about 4 mini marshmallows. Bake again for 5-7 minutes depending on your oven. Cookies should be golden and marshmallows will be very lightly toasted. 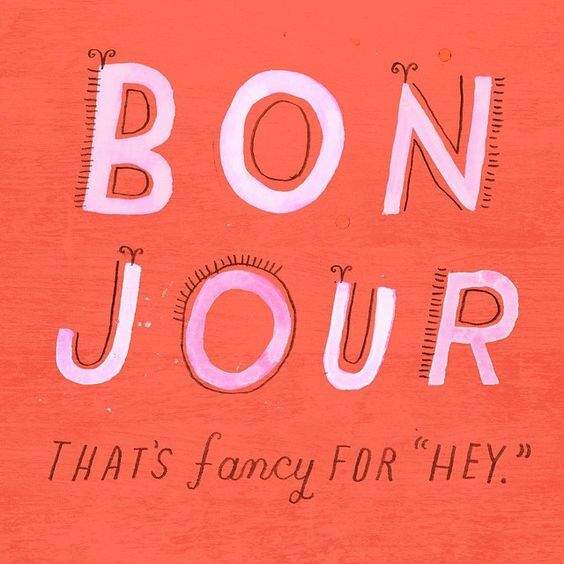 Let's keep it simple today. If you don't mind me asking, how old are you? Me - I am 34. I purchased this the other day from Nordstrom. It's $16, so a mid-priced candle, but the scent is SO good and strong. This brand of candles will put a delicious scent in your home with the lid off, without even burning it. We had gardenia bushes in our yard growing up, so I love the smell. Big, big changes this week -- my parents sold our childhood home. I'm sad but honestly so excited for them to be retiring at the lake, where there are lots of great memories that will await us. Laura and I drove down Tuesday to help them pack and spend one last evening around the dinner table. We ordered Chinese takeout and it was the highlight of the trip -- that last dinner all together. 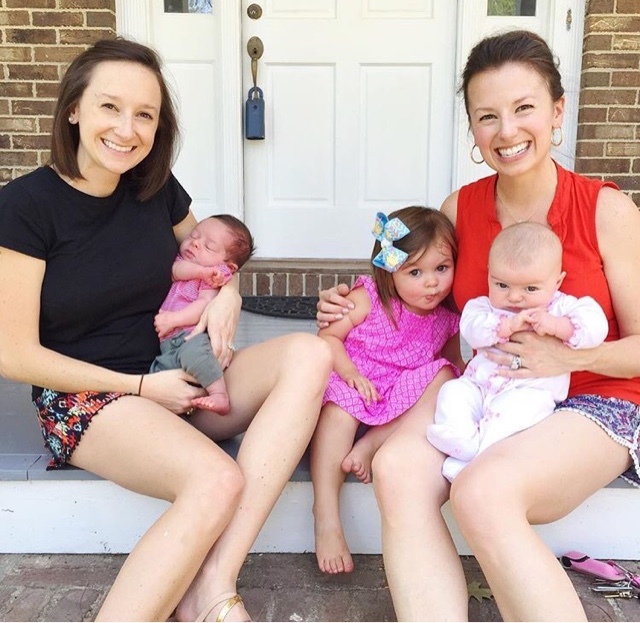 Before we left town Wednesday, Mom snapped this photo of Laura and I with the babies on our front porch steps. The other day I received my first Thred Up shipment ... I got three pieces, all for myself! I used code SUMMER (for your first order only) to get an additional 40% off of the already low prices. My savings were incredible. I plan to share photos on the blog of what I ordered. Overall, VERY happy with this awesome way to shop! They also have this adorable romper from Gap in a 2T that would look so cute on Camille. Great items for kids! Also, somebody please scoop up this baby Lilly bathing suit, 3-6mos, new with tags! If you've never ordered with them and can get 40% off the price of $41.49, it's truly a deal! 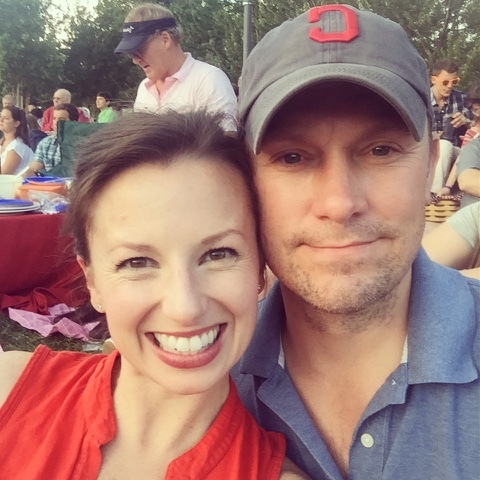 On Sunday, Ian and I went to Pops In The Park, where the Charlotte Symphony played some awesome John Williams tunes. We snacked on cheese, salami, crackers, blueberries and frozen grapes, and brownies. We live in walking distance of the ampitheater and it was so nice to be able to stroll there and back. 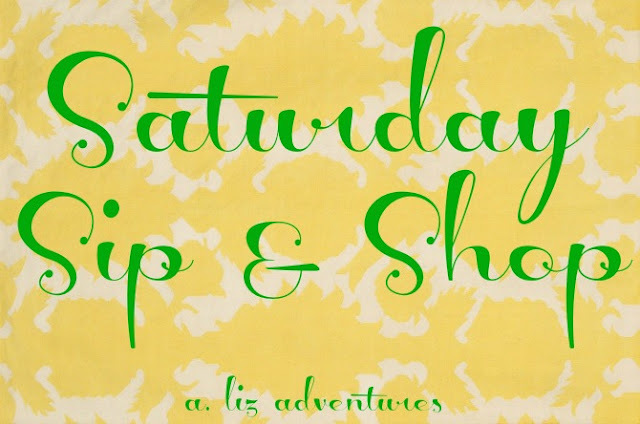 We have an awesome weekend planned with my mom's side of the family -- much-needed after lots of big changes going on in everyones' lives (a retirement, a graduation, two home sales, two home purchases, two babies born in the last two months, a cross-country move, WOW!). I have a crisp bottle of New Zealand sauv blanc that is calling my name ... Aaaaaaaaaa-pril! Aaaaaaaa-pril! We have a VAT of premade margarita mix in our fridge. The bottle is huge. It just tastes so generic, so I've been experimenting around with ways to snazz it up a bit. Last night I muddled some fresh blueberries at the bottom of a glass with a small dash of simple syrup. On top of that muddled goodness, I added a shot of tequila and ice and then filled it up with the mix. 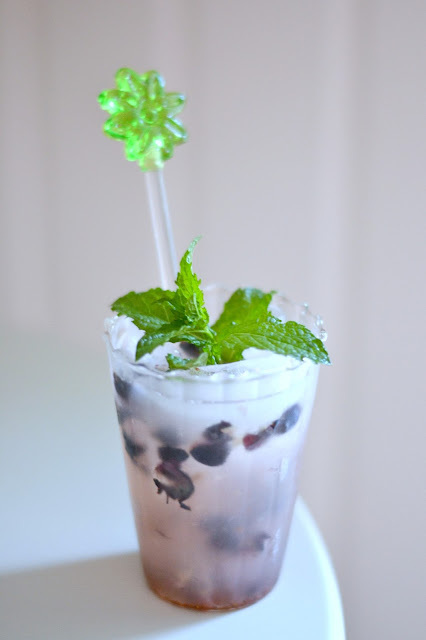 The mint from our yard added a nice minty flavor to this blueberry lime margarita. So very easy, and you could sub different muddled fruits and herbs for different tastes. 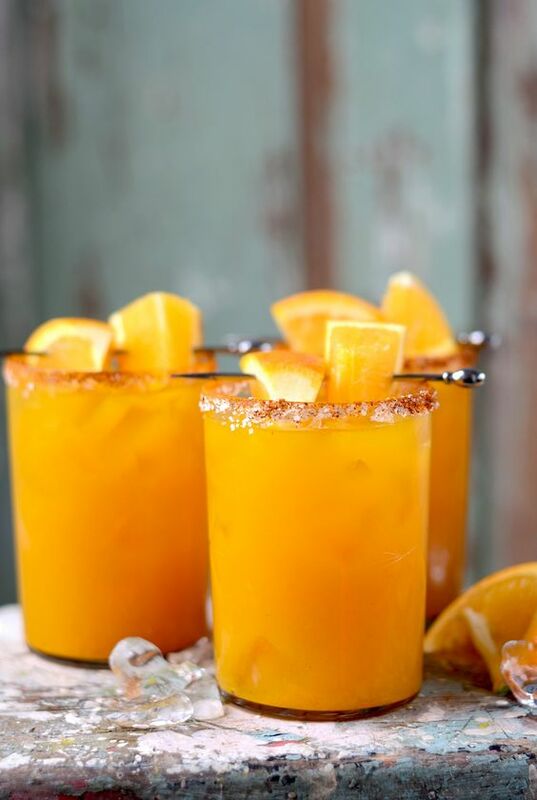 A rosemary peach margarita maybe? Or a cilantro pineapple margarita!? 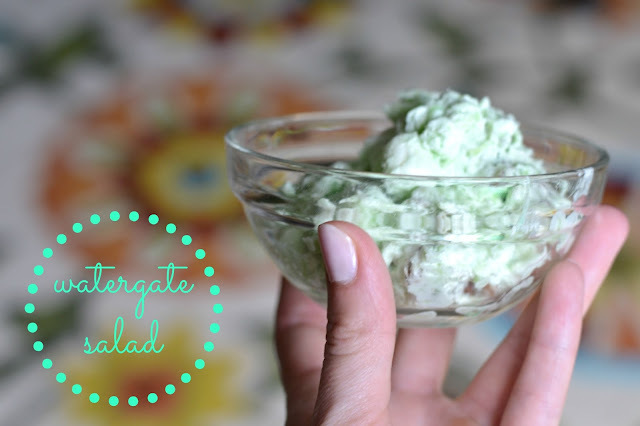 This past Saturday evening, I made Watergate Salad as a side dish. What I like about this dish is how simple and retro it feels. No KALE. No CHIA. No ZOODLES. Just a good ol' fashioned side dish that contains whipped topping and marshmallows. I can definitely wrap my head around that. In a large bowl, mix together pudding mix, pineapple with juice, marshmallows, and nuts. Fold in whipped topping. Chill. I love a recipe whose last line is "chill." Is this referring to the dish, or the dish preparer? Let's go with the dish preparer. And chill I did, because I knew that I had some green fluffy goodness awaiting me for dinner. 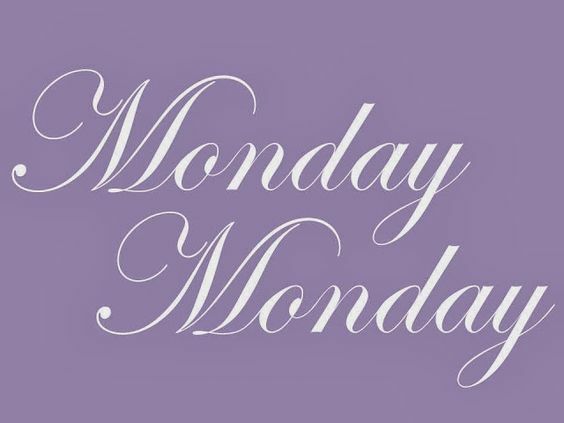 It's a Monday morning ROLL CALL! I'm so glad to hear from many of you that you enjoy these discussion topics. Remember that they are only fun if you're participating, so please take the time to comment with your two cents! I truly enjoy reading all of your comments, and it has really helped me to feel re-energized again connecting with the blog reading community. I saw in a Facebook group this weekend a mom inquiring about whether she should allow her begging teenager to have Snapchat or not. She said that her kid was the "ONLY one at school without it" which got a lot more responses in return about how other womens' children were the "ONLY ones" without so-and-so. It really took me back to when I was growing up and, you know, life was sooooo unfair because of ... whatever it was at the time (far removed from Snapchat). Tell me about your experience with this. Life was SO unfair because you were the only one who could not __________ ? We got HBO back and I positively FLEW through Girls season 5 ... did anyone else watch it? I absolutely love that show. Not one you'd want to watch with your mother-in-law, but a true guilty pleasure of mine. The show is so well-written and I love watching Lena's commentary at the end of each episode. 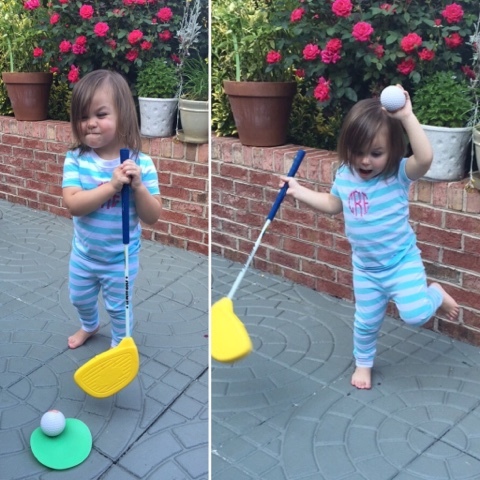 Camille's been alllllll about golf recently (maybe because it's constantly on our television). Ian bought her this toddler-sized Golf Set from Amazon and it's been a lot of fun to play with in the evenings before bedtime, when it's slightly cooler outside. I had a chance this week to flip through a magazine while we were at the library. I used to get a few magazine subscriptions a month, and then I got tired of never having time to read them and I let the subscriptions lapse. 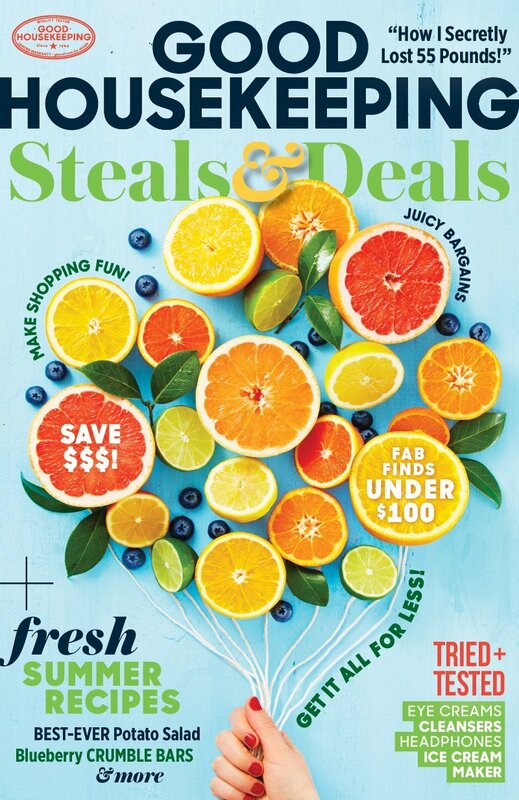 Not to sound too old (common theme here today), but the magazine I picked up this time was Good Housekeeping and I REALLY enjoyed it! I think they have rebranded a little bit to make it appeal to a younger crowd. I saw that I can get a year subscription on Amazon for only $5, so I jumped on that deal and ordered it. Lastly, it seems as if y'all are enjoying the Monday morning Roll Calls as much as I have been, so we will do another one this coming week! If you have any ideas for topics to cover, I'd love to hear them. Ian bought a three-pack of romaine hearts last week which was ... super random? We already had two other kinds of lettuce in the fridge -- organic mesclun mix (my choice) and iceberg lettuce (his choice). So, when I opened the crisper and saw the romaine, I was just like -- okay. We have too many lettuces in this teeny home. We were grilling out burgers the other night, and I remembered that I'd recently seen a recipe for grilled romaine. A quick Google search, and we had a great and easy side dish! You'll want to cut your lettuce in half and then put all of your good seasonings on the cut side (flat side). Drizzle them generously with olive oil and shake on steak seasoning. On to a hot grill they go, cut side down, for five minutes. You'll know they are done when they are nicely charred and wilted. Served alongside burgers and a fresh fruit salad, this was a great way to get in some greens! AND, a great way to put a dent in the plethora of lettuces in our fridge. Move over, fashion bloggers. I'm here to share the amazing fashion finds that I recently snagged at THE WALMART. Look, it may not be as glamorous as a Neiman Marcus shopping experience, but the draw for me here is 1) cheap cheap cheap, 2) not going to cry if it gets spit-up on it, 3) probably nothing in Walmart is dry clean only, and 4) I can pick these items up at the same time as I'm getting diaper rash cream and tin foil. So, now that I've got you on the edge of your seat about my Walmart finds, here we go. And these items are actually pretty darn great. Hot weather is officially here in the Carolinas. We've been spending great time outdoors, whether it's in our backyard or at the park. My yoga pants still maintain a special place in my heart, but I need shorts for the heat. These awesome shorts have a mesh layer over a "compression" layer. I put that last part in quotes because, while they do sit flush to my thighs, I wouldn't say that they are tight enough to be compressing anything. BUT, the reason why they are a win in my book is that I can PLAY with Camille without worrying about my shorts exposing too much fanny. I take her to My Gym class where we do activities together ... one part of the class has her sitting on my lap and then we rock back together and then rock back up to a sitting position. I haven't been comfortable doing that in regular running shorts because it's just -- not pretty. These shorts will be perfect for that class. I picked these up in the gray/neon yellow combo but now want another pair, either the black/pink combo or black/gray. I went with a size small and they fit me well (I'm 5'2"). 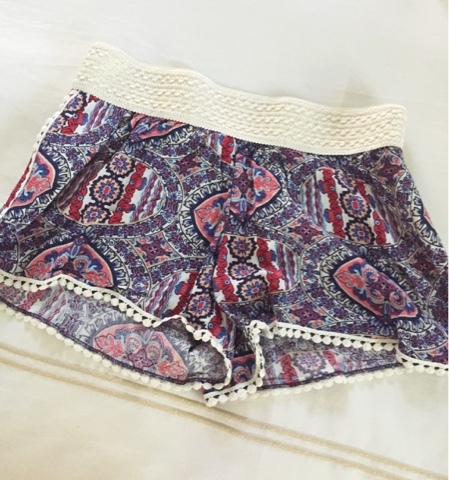 I mentioned in my Five On Friday post how much I was loving the crochet waist shorts that are only $7.88 ... they are in the juniors section. I picked up a second pair yesterday -- black and white. Love 'em. 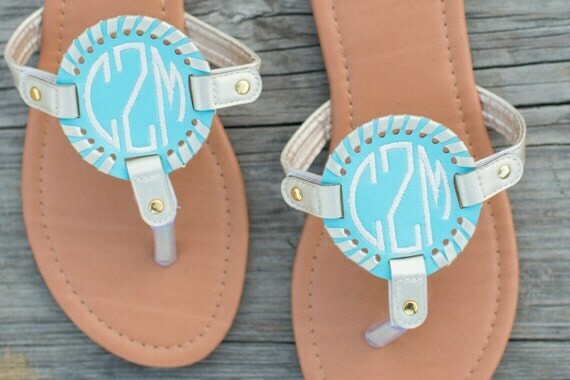 Will look so cute with a colorful tee and metallic sandals. Not a lot of sizes remain at all online, so you may need to pick these up in store. I am not yet comfortable wearing a normal bikini top -- I'm two months postpartum, so tankinis and one-pieces will be my go-to for the summer. I have some black bikini bottoms already, so I picked up this tiered ruffle tankini top yesterday to pair with them. It actually looks really nice with the metal rectangular beads on the front ties. It comes in other great colors like coral and baby blue. A tip I learned from my blogging friend Justine is to order at least $50 of items from Walmart.com to earn free shipping (big household items are a great idea, like your mega pack of toilet paper -- because who wants to walk around the store with that beast?) and then you can try on in the comfort of your own home and return anything that doesn't fit to the store. Anna Wintour, eat your heart out. I'm coming to get ya in my Walmart shorts. You know what was fun? Last Monday's roll call post. I had just shy of 300 comments (it's not too late if you'd like to join in!) and it was SO fascinating to me to hear a little bit about you. Your name, where you live, some of you even chimed in with how long you've been reading here, and duh! - what you had for breakfast! That was SO fun. I promised prizes, and prizes you will get. Your next coffee and cake pop are on ME. Please email me if your name is below so I can email you $10 to Starbucks! 100th Commenter: "Brittany from South Carolina - banana with almond butter & coffee to drink!" So, can we keep this going? Because I truly, TRULY loved hearing from you. Me? I'm currently staying at home with my daughters. I also make children's hairbows to make a little side money :) Until last year, I worked as a health and wellness account executive with an insurance carrier, and I helped our companies put wellness programs in place for their employees and health plan members. When I go back to work, I'm not sure if I'll try to stay in this type of industry or if I will want to do something completely different (my degree is in Spanish). Your turn! What do you do? A mom in a local reselling group here in Charlotte raved about these WALMART SHORTS ... yes, you're hearing me correctly. I picked them up the other day and they are great. They are $7.88! If you are ordering online, I typically would have picked up a size XS, but I wanted to err on the side of them being a little looser than tighter on me, so I went with the small. I'm glad I went that route. I wore them yesterday with a slouchy grey v-neck tee from Loft and some silver sandals. Definitely a great find! I'd love to order them in another color or two. Speaking of a great find, yesterday I purchased this Gold Leaf Chandelier after seeing it on Copycat Chic. This is one of my favorite blogs to follow. 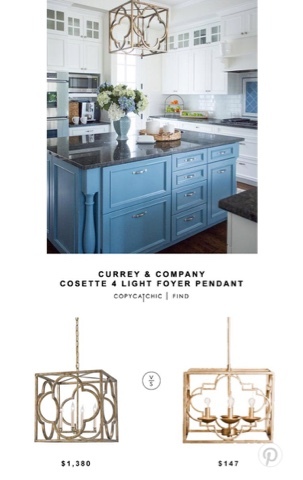 They post a beautiful decor item (like the chandy on the left coming in at nearly $1400) and then a less expensive copycat version. I could not turn down the $147 version -- and it should be here in just a few days! Cheers to beautiful, sunny afternoons! 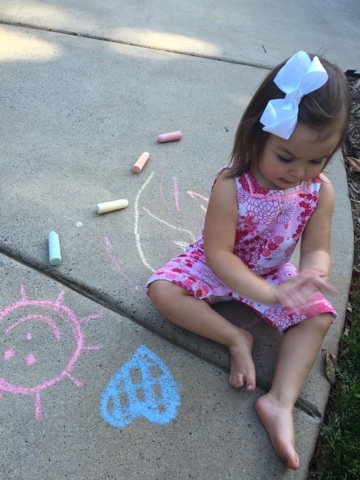 We broke out the sidewalk chalk yesterday from the dollar store and Camille was definitely a fan. Three cheap things you can snag at Dollar Tree for these fun summer days: sidewalk chalk, bubbles, and silly string. All toddler approved. At my aunt's suggestion, we have started watching Bloodline on Netflix. We are three episodes in and we are absolutely hooked. Family drama -- everyone has it. Who else is watching? 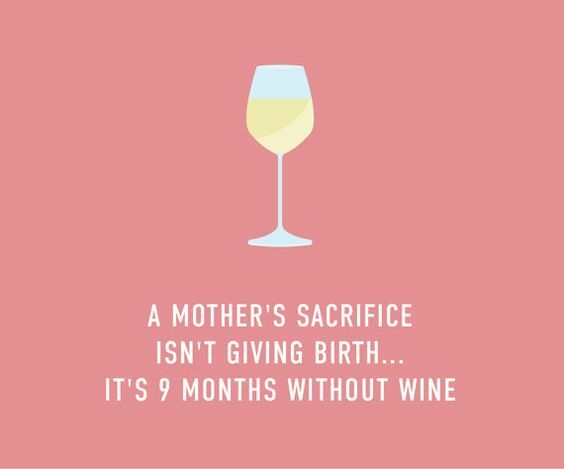 Lastly, for all of the mamas out there who are nursing. 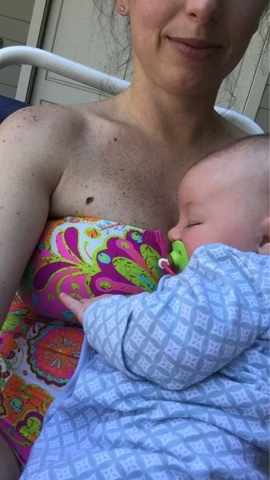 My sister told me about these Milkies for when you are breastfeeding. For the price, I just wasn't sure if I wanted to pull the trigger on them, but I ended up ordering them. 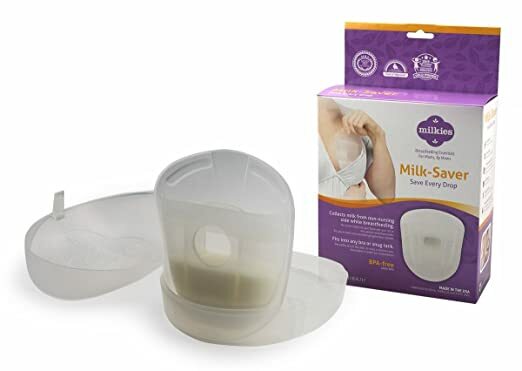 When you are nursing on one side, you just slip this on the other side and it collects leaking milk that you can then add to a bottle and save for later. I'm personally able to save about 0.5-1 ounce each time that I feed Charlotte. I've been adding that milk into a bottle to keep in the fridge or freeze ... great for when we have a babysitter. I'll do a post later about favorite baby items this second time around, but I just couldn't help but to share this now! Ian and I always laugh at the term "Steak Dinner." You know how people use it to describe a really shi-shi night out ... like "Oooh, he took me to a Steak Dinner." What is a Steak Dinner? Is any dinner a Steak Dinner if you order steak? What if your partner orders shrimp? Has he/she ruined it? I cooked a great Steak Dinner here at home the other night. I preheated the oven to 400 degrees and set a burner to medium high. I rubbed two steaks (sent to us from Omaha Steaks from my beautiful Aunt Karen) with my favorite steak seasoning from Aldi. A container is $0.99 and it's seriously the best. I browned some butter in a cast iron skillet on the stovetop and seared each side until it was nice and golden brown. Then, into the oven the whole cast iron skillet went for eight minutes. Next time I will probably start checking them at 6-7 minutes ... just depends on how done you like your steak. Roasted cabbage was an easy side for this meal. It was left over from the other night so I just reheated it in the oven in foil, but basically you just cut cross-sections of your cabbage, lay on a foil-lined baking sheet, drizzle with olive oil and shake on MORE of that steak seasoning (we seriously use it all the time) and roast until browned and softened. Also, I firmly believe that if you lay your meat over a vegetable like I did above, it looks totally restaurant-worthy. Try it! And lastly, for our salad, I used the failproof trick of making sure it contains FCN ... a fruit, a cheese, and a nut. In this case I went with diced apples, sliced almonds, and goat cheese. I made a vinaigrette from blood orange olive oil and red wine vinegar. And that's a wrap! 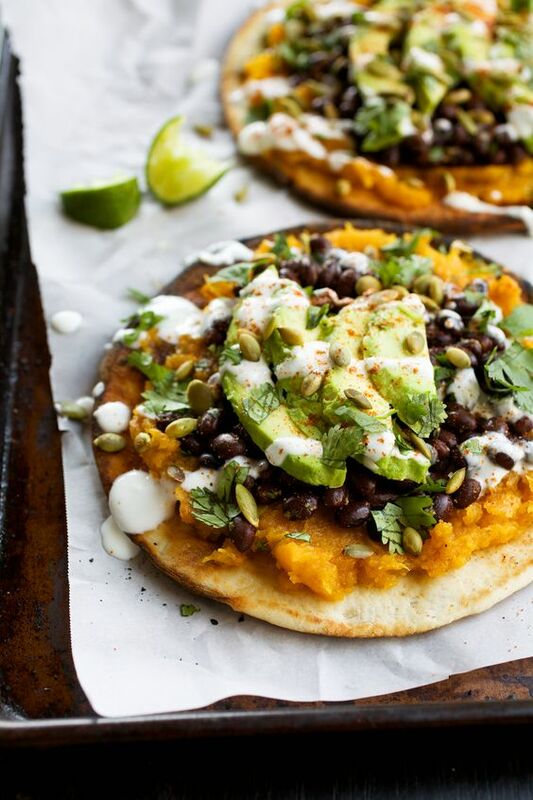 An easy dinner, healthy too. Our fancy schmancy STEAK DINNER.